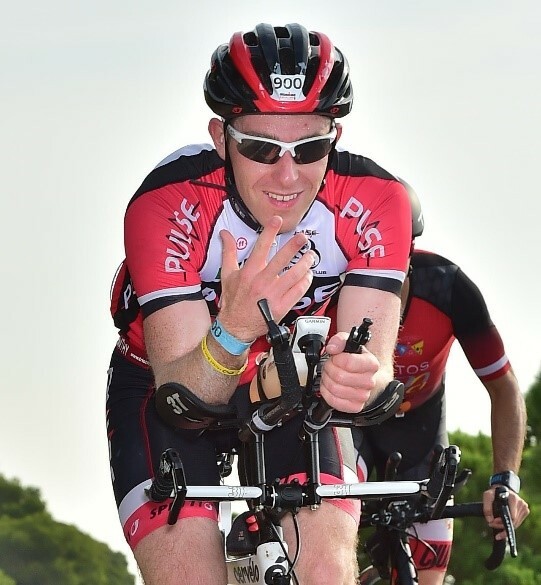 Ironman triathlon, a 3.8 km swim, 180 km bike and a 42 km marathon run, a huge undertaking. To get to the start line is a huge achievement, many hours of training, months. I invested in a new bike a Cervelo P3 time trial bike and I fell in love with it. Once I got a bit comfortable on it a rear disk wheel was put on it. It looked the part if nothing else, beautiful machine. Training for Barcelona was hard, morning and evening sessions were introduced and I was pushing harder than I had for Galway. I was stronger and strength and conditioning in Base to Race with Joe was a huge help and brought me on a terror. The year went well, I took part in a few events, Wicklow 200, Double Olympic in Athy where I came first in my age category. 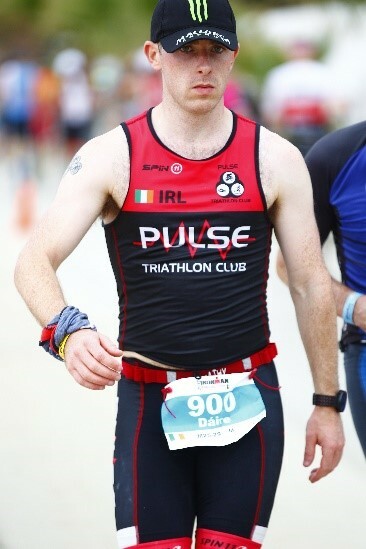 On a windy day in Tyrone I went under 5 hours for the first time in a half ironman distance event. Things were looking good for Barcelona. My aim for Barcelona was one cross the finish line and two try break the hour mark and finish in under hours, it was going to be tuff but I felt it was achievable going by how I was training. Race week started with a sports massage on Monday from a woman I have used for years, Eva Fidgeon, based outside Bailieborough, her hands are magic. Unfortunately I had missed Ship My Tri Bike so invested in a bike case. Tuesday was the day to pack up, flight out was Thursday morning. Got advice on how to put bike together again and done a practise run on Tuesday, went well and was happy enough. All ready to fly out, a fry had to be had in the airport Thursday morning, its only right. 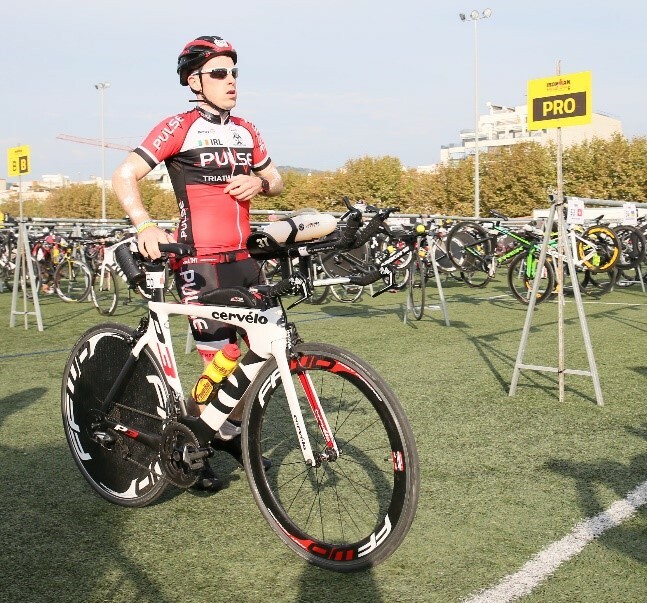 Finally after 8 months hard training we were in Barcelona, well Calella where the race is held. The excitement and nerves were building. There was a strong Pulse crowd taking part and a mighty support crew had also made the trip, my parents had also made the trip. Done the practise swim on Friday morning followed by the race briefing. A short bike check cycle followed to make sure bike was put back together correctly. We then racked the bikes and transition bags. Mad for action!! Start time was 8:20 for age groupers. We arranged to meet at 6:30 and walk up together. Crack was good on the walk up and everyone was in good form. Checked the bike and pumped a few wheels. Excitement was building, music blaring, shout outs being said over the speakers. What a show. The butterflies were flying in the belly. I had never been this nervous before a race, was having kittens. The support crew were helping keep the nerves at bay. Pictures were being taking, selfies, flags wrapped around us, tears flowing and hugs and good wishes everywhere. As I mentioned my aim was 10 hrs. 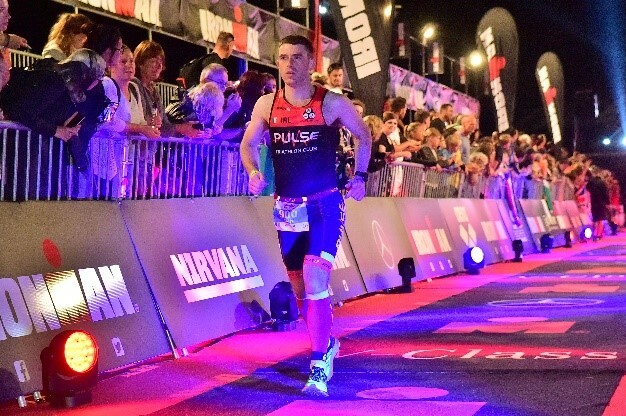 I planned to leave all out on the course, empty the tank but controlled and enjoy my walk down the red carpet of the finish line with the Tri colour in my arms. Unfortunately this wasn’t how it happened as will be seen in the coming report. The start was amazing!! The atmosphere was electric!! Pro men and women roll call, no anseo like in school. Music was class, tunes were hopping. And away we went. It was a rolling start and I chose the 1 hr 10 min swim time to go with. We couldn’t have had a nicer day, sea was a mirror, flat and calm. I was delighted with my swim and completed it in 1 hr 8 mins, box 1 ticked. I was so happy leaving the water. Passing the gold caps of the All World Athletes was a huge lift. Saw a lot of swim caps on the sea floor and prayed that mine would still be on me at swim exit, which will be used in UCD. I left the water with a huge smile on my face, delighted with life. After a change into cycling gear I was away on the bike, my favourite part. Well, that bike can move!! Lovely roads, why can’t we have them in Ireland. Cycled with a smile. Kept the heart rate in check, no point busting the cycle and have nothing left for the run. A headwind on the way out meant a tailwind back. Eased off a bit on the way out to save energy, I don’t see the point pushing hard into a headwind, race sensible, tis a long day. Had my own drink bottles in the special needs bag and collected them, lucky for me my bag was at the front. Was taking water and bananas at the feed stations along with my bars I had in my cycling jersey. Was a warm day and was drinking more than normal, my own drink ran out so had to start taking Powerbar isotonic drink supplied, or piss as I call it now, sorry about the language. This drink proved to be my downfall. In hindsight I should have brought the SIS stuff I use and mix them on the course. They come in a handy tube and are a soluble tablet. It was the last three stations I had to use Powerbar. I didn’t know then but Powerbar doesn’t agree with me, I would find this out on the run. The support crew were savage and the atmosphere at the bike turn around was unbelievable. Wow!! There was even a Pulse man, Vinney, out on his bike about 15 km into the cycle with the flags flying. My bike split was 5 hrs 18 mins, which had me 48th in my age category and in the top 800. I didn’t know these placings at the time. Again I was a happy man getting off the bike, knowing I had a good cycle and felt good ahead of the run. I was feeling good and felt sub 10 hrs was still achievable with a solid run. Off with the cleats and on with the runners. I also changed socks put on compression things on the calves and a tri top. Onto the run course feeling strong and still very happy. As on the bike course Pulse could be seen everywhere, what a club, I also seen Mam and Dad. The first lap was uneventful, settling into a rhythm and pulling back a small bit. The run was a flat out and back route of 2.5 laps, lots of gravel surface which I like. My run plan was to run a negative split and up the pace slightly on the second half as I had done in training. Lap 1 took 50 to 60 mins. There was then a slight wobble when I felt a bit of stomach discomfort, not ideal. After a few burps this eased a bit and I was feeling ok but not great so I eased back slightly. Little did I know my race was soon about to blow up and a long day was about to follow. The wheels came off quickly and within 1km I went from running well and feeling strong to getting sick. The next 30 km would be hell. Unfortunately it was now I was finding out Powerbar isotonic drink didn’t agree with me. The marathon would take me 6 hrs 50 mins and I would have to walk the most of it. It was horrible as I got sick 5 or 6 times. I really had to dig deep and this would test my mental will power like never before. The support I received from Pulse was second to none and I cannot thank them enough, I wouldn’t have finished without them. I was in tears at numerous points and seeing their faces helped no end. Turning back to go out for the final lap was heart-breaking, I was a broken man. The happy smiles of the swim and cycle were a distance memory. I didn’t think this final lap was in me as I was still getting sick and very emotional. I was in tears as I turned around and seeing my mam and dad, heartbroken as they were looking at me struggle the floodgates opened. If I had stopped then and gone over to them I wouldn’t have got going again. I was broken, physically and mentally. I stopped dead, in tears and very low. All of a sudden I was surrounded by Pulse members. They picked me up and got me going again. I was struggling there was nothing in me but still getting sick. I was drinking and eating nuts and bananas but they weren’t staying down. It was on the return leg that a medic scooter started to follow me. I gathered myself and he left my side. Scary. Finally on the home straight but these last few Kilometres were horrendous. It was at this point that Miriam and Eithne linked me, I was in bad shape. They told mam and dada to get to the finish line and continued to help me. I have to be honest now and admit I don’t remember anything from the girls left me until I awoke the following morning. My body completely shut down. After getting my medal I was taken by the Red Cross into the recovery area. Mam and Dad have helped me here. There was a lot of worry for me. While on the recovery bed my legs were moving as if I was still on the bike and my breath was rapid. Then they seized solid and started to cramp. The medics then put me on a drip and gave me a pain relief injection. After an hour and a half here the ambulance was called and away to hospital I went. My poor parents. I got another drip in the ambulance and two more in hospital. Mam and Dad finally got back to their hotel room at 3:30. I don’t remember any of this and got one hell of a shock when I woke up. More blood tests and once my sodium levels were back to normal I was discharged at half 2. It is now that people should pay attention. It was by chance that I purchased the one day licence from Ironman. Due to me buying this and not relying on my Triathlon Ireland licence Ironman’s insurance covered my hospital expenses. 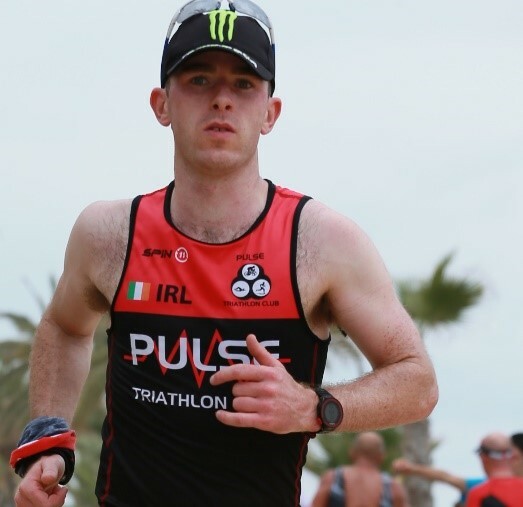 If I had used Triathlon Ireland I would have been stuck with the bill. Even as I write this I have mixed emotions. I am immensely proud of what I achieved after the horrific day I had and how deep I had to dig to get over the finish line with my body in pieces. There is also a heart-breaking empty feeling, maybe empty isn’t the word. The best way I can describe it is like a relationship break up. You expect so much from this relationship but it fails to deliver. 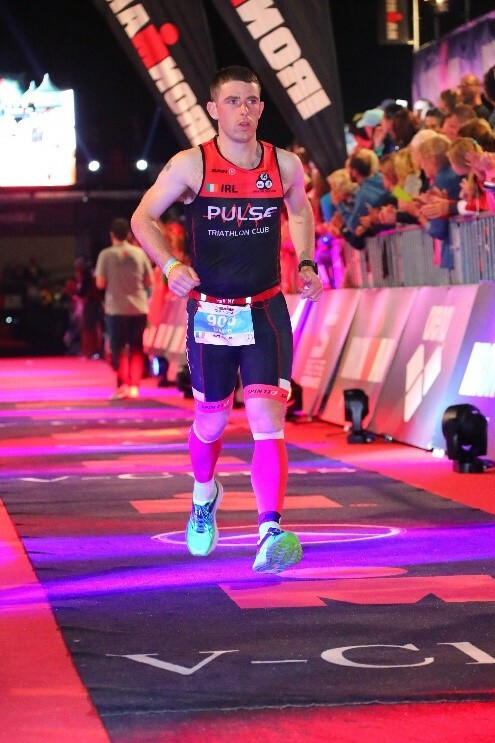 This is how I feel about my Barcelona race, there is no denying how proud I am about getting that finishers medal and t-shirt but I had hoped for so much more, sub 10 hour, the walk down the red carpet, the feeling of ecstasy hearing the announcer say those immortal words “YOU ARE AN IRONMAN”. These I don’t have as I do not remember crossing that finish line and it was as if it was taken from me, all because of that Powerbar drink. People may say, you pushed too hard on the swim or bike, but there was where I trained all year, I kept in control. I raced by how I felt and then dropped back a fraction as adrenaline could have pushed me on a bit too far. I felt I never hit the red danger zone. 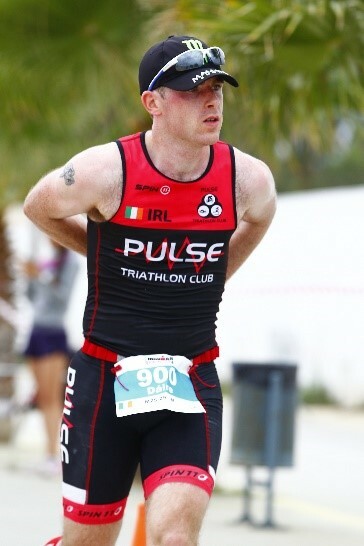 I know I am young and have no doubt better days will lie ahead, I am still a double Ironman at 27 years of age. I have to look at the positives which there are many, but it wouldn’t be true to the competitive sports person in me if I didn’t feel a small bit disappointed after the race, after all I invested into it. After all my time may say 13 and a half hours racing but, in truth, it is an 8 month race and everyone who stands on the start line is a winner. Triathlon at its core is three sports swim, cycle and run but when you go long distance there is a fourth discipline which is nutrition, before, during and after. This is where I have much to learn. Bring your own nutrition is key as it is with this your body is most comfortable. While thinking back it is amazing what the body can do and how hard it can be pushed. This is going to take a while to get over as I was in pieces on that finish line. Better days do lie ahead and I will learn so much from this race and will hopefully become a better athlete as a result.